Graphics: Martin Galway, Ashby Computer and Graphics. Lunar Jetman was part of a huge classic genre on the Spectrum which spawned a few games by Ultimate featuring the Jetman character. The range of games however never quite made their way onto the C64. Spectrum users had Jetman, whereas C64 users had to make do with Sir Arthur Pentadragon in a series of games. However, little do many C64 users know, but Lunar Jetman was actually in development on the C64 (albeit for a short period) back in 1985. What might be more surprising is the fact that the conversion was being carried out by SID’s own maestro, Martin Galway. As well as being a superb musician, he could code a bit too you know! During some quiet times for Martin back in 1985, attempts were made to convert the classic to give himself something to do. With the conversion and Martin’s perseverance, nothing was sacrificed from the spectrum game. This was not a pure spectrum port, but coded from scratch with all original screen dimensions kept. A very faithful conversion was what Martin wanted with nothing spared, and that was what was exactly emerging. After less than a months work, Martin’s career took off as a musician at Ocean Software after impressing with his BBC tunes and other freelance tunes. Coding games was put aside as this career blossomed, which meant that the C64’s Lunar Jetman was promptly shelved and long forgotten about. In recent years, Martin passed all his disks to the guys at C64 Audio to fully archive all his tunes in their full glory. 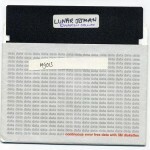 The surprise finding was a disk labelled ‘Lunar Jetman’. Upon examining the disk, a series of sources files were found. After compiling the sources, it was found that all the score panels were working; sprites were animating and the screen scrolled a bit, but sadly nothing was ever near playable. But it was Lunar Jetman on a C64. Chris Abbott paid for all the disks and C128D to be shipped from Texas especially, so thanks to Chris the game was uncovered along with Jason (Kenz) Mackenzie. Check it all out in this exclusive look at the C64 conversion. Also included is all the source code which was used to build it all. Jason Kelk’s detail of the disk content can be found in the zip archive with the sources to explain what was on the disk (Its been ported exactly how it was on Martin’s disk). I believe the Lunar Jetman project was something I was working on as a side project. After I'd connected up Paul Proctor to Rare (we were doing their BBC conversions), Rare were still big in my mind, and when I was taken off the C64 Match Day project to concentrate soley on audio, I think I started that project just to keep my chops up. If I recall correctly any work dates on that would have been around April 1985, am I right? I'm sure I would have done great sound on it, but that would have been last on the list."